Ever wonder what happens to your games and gear after you trade them in to Gamestop? Some games, obviously, get put back on the shelves—the hope is to resell them. But not everything gets resold. YouTube directors John H. and Richard G. fill their channels, "TksJohnFilms" and "OKChief420," respectively, with videos of their excursions to local Gamestop stores. Many of their videos are wildly enthusiastic, like when John H. found unused Playstation Network and Microsoft Points cards or when Richard G. found an entire Xbox 360 Kiosk, television and all. It isn't just older Nintendo 64 or Sega Genesis carts turning up in Gamestop's trash. Multiple Xbox 360, Playstation 3 games, and some older console hardware routinely make an appearance. While you probably won't find an Xbox One game in there yet, you may be able to find a headset, controller, or even a handheld console among the debris. Allegedly, Gamestop knows of the practice and sometimes directs employees to destroy gear before it gets thrown out—that way people can't dumpster dive for it (and then potentially re-sell the gear to another Gamestop). If true, it means that Gamestop is destroying perfectly good games. 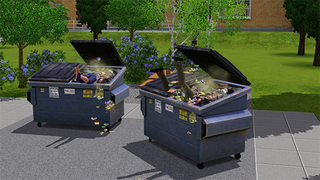 We've reached out to Gamestop for comment about policies regarding dumpster diving, and will update you as soon as we hear back. Otherwise, check out IGN's full report to hear more about the folks who dumpster dive—it's worth a read. And a quick word of caution: you probably shouldn't dumpster dive unless you're sure it's legal where you're from.